Food service uniforms have functions that go beyond the aesthetic and the practical. When it comes to the food service industry, properly processed and cleaned uniforms and linens serve as an all-important barrier of protection for customers against disease-causing microbes and pathogens. Would you really entrust your food processing uniforms’ laundry and maintenance to inexperienced individuals? Do not take that risk. Lend your trust to a company that has proven its credibility, expertise and reliability with years in business and a whole list of happy customers to back it up. Trust Republic Master Chefs! Republic Master Chefs fully understands the specific requirements for linens and uniforms for this industry. That is why our specialized linens and apparel have been designed not only for the practical needs of food processing workers but are made to comply with the specific requirements set by the government for this industry. We have matched this excellence in product line with a USDA-compliant linen treatment process to ensure that every batch of linens and apparel used at the beginning of each shift is fresh, clean, and safe to use. Republic Master Chefs has over 80 years of experience in the business and we never stop improving our services. For more than 80 years, Republic Master Chefs has been serving countless food service businesses including commissaries, commercial kitchens and food processing plants, with uniforms and linens in various counties in California. We specialize in providing linen and uniform services for the food processing industry so you can rest assured that each item has been processed according to the specific and highest standards for the industry. From our pickups and deliveries to the way we inspect each item in our world-class laundry facility, we implement and follow the strictest measures – for your client’s safety and your peace of mind. 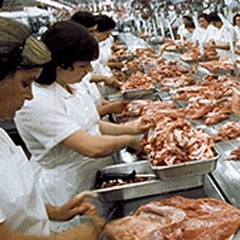 The safety and integrity of your food processing uniforms and linens is not something you should ever take risks on. For all your linen and uniform needs, trust only the specialists in food industry linen services. Trust only Republic Master Chefs! Call us today at 800-640-2433 to get started!